If you are going to have an apple themed shower, you have to have apple pie! Am I right?! I went back and forth deciding what kind of pie to make, but in the end decided a slab pie was the right way to go. That way people could take as big or little of a piece as they wanted and there was sure to be plenty for everyone! To mix things up and make it extra fun, I threw a little cornmeal into the crust and used apple cider instead of water. The results were amazing, if I do say so myself! The pie actually comes together really easily, even if there are quite a few directions to follow. The crust can be spread out in the pan with your fingers, which is a lot easier than rolling it out! The apple slices are tossed with cinnamon and sugar. 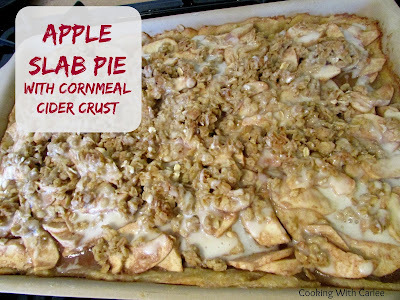 Spread a little crumble topping over the apples and you are ready to bake! I drizzled it with a little vanilla glaze to get the creamy vanilla flavor without having to have ice cream on the buffet as well. It definitely hit the mark. Despite having so many options to choose from, this pie was better than 2/3 gone by the end of the afternoon! In a food processor, mix together flour, cornmeal, sugar and salt. Add the cubs of butter and pulse until pea sized. 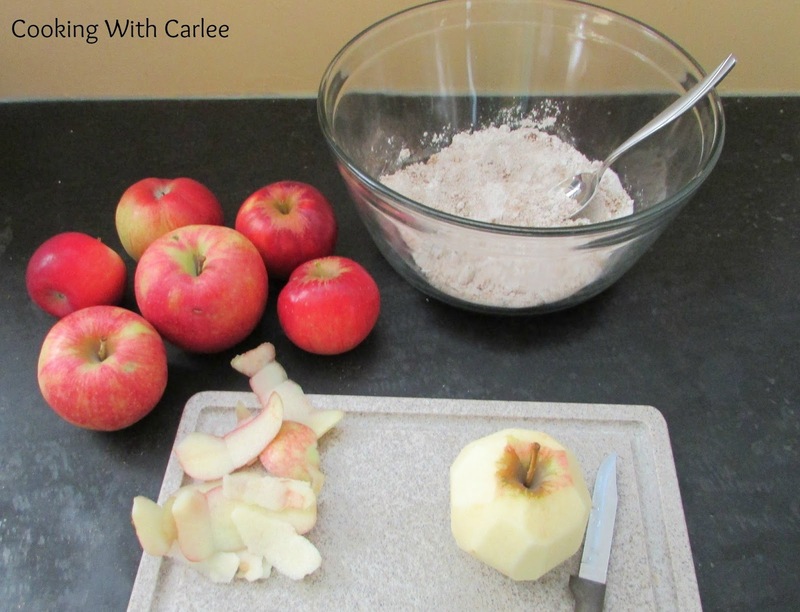 Add the cider a tablespoon or two at a time, pulsing the food processor as you go until the dough just comes together. You want to stop as soon as it starts to form a ball, you don't want a wet dough. 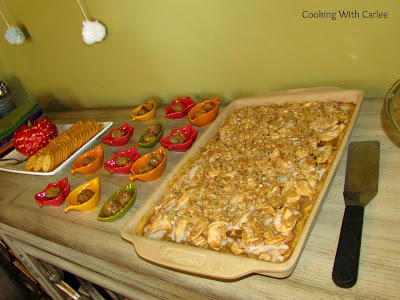 Empty onto a 10x15" rimmed baking sheet or bar pan. Press dough into pan to cover entire bottom and make a small crust lip around the edges. Mix together sugars, flour, cinnamon, salt and nutmeg. Toss the apple slices in the mixture and set aside while you make the topping. Stir occasionally. Take crust out of fridge. Arrange filling over the crust so it is evenly covered in apples and any apple juice from the bowl. Using your fingers, spread clumps of topping over the apple mixture so that it is evenly distributed. Bake for 10 minutes at 375 F.
This would be great served warm with vanilla ice cream. I didn't want the mess of ice cream at the shower and there were already so many options, so I did a quick drizzle of powdered sugar, vanilla and cream instead. That way there was some creamy vanilla flavor without worrying about keeping the ice cream frozen. Have you signed up for our mailing list yet? You really should! We send weekly emails keeping you up on some of our favorite recipes. This looks delicious. 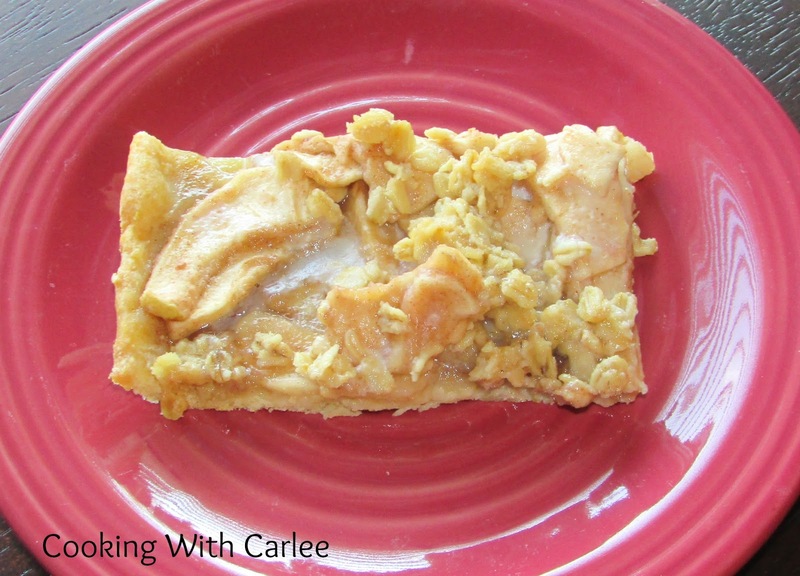 We live in "apple country" and I am always looking for different apple recipes! Everyone who has shared this with us really enjoyed it, we hope you do too! Cider Corn meal crust?? Wow, how different!! Love the idea of a slab pie! Thanks Jenna! The cornmeal adds just a little bit of texture and I figured why not use cider instead of water?! I really liked the way it turned out! It adds just a little bit of texture! We really enjoyed it. Thanks Christine! I have had plans to make a Apple Slab Pie for some time now...I am going to have to try this one with the cornmeal crust. Looks fabulous!! I hope you love it! I have been wanting to try some variations on pie crust for a while now, but was scared to mess with it too much for a traditional pie. For some reason a slab pie was a lot less scary! LOVE a slab pie. Cornmeal is so delicious with berries and apples. I'm bookmarking this one- nice! Me too! I hope you love it! I've really been wanting to make a slab pie for a while. This sounds amazing! I hope you love it! This one was fun to make. We have been having fun playing with some different options when it comes to slab pies! Wow, Carlee, you have got to have the best recipes! Thanks for bringing this over to Throwback Thursday!! Never thought of adding cornmeal to the crust...great idea! Thanks for sharing on My 2 Favorite Things on Thursday!! Hope to see you again! Pinned! It adds just a little bit of texture, we really enjoyed it! Thanks for hosting!